Nowadays, it’s not uncommon for creative people to showcase their work on the internet. I am talking about online designs and also unique product creation. If you’re searching for a breakthrough using these skills, here’s your chance to learn how to make money with Zazzle. Don’t blink because I am pretty sure that one of these methods will be useful to you. 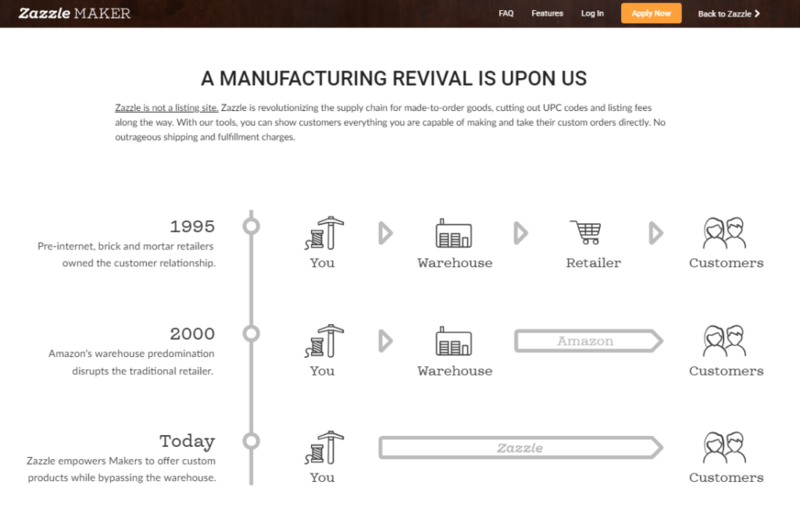 Launch in 2005, Zazzle is an online marketplace that provides customized printing for white label merchandise for designers and customers alike. Designs are provided by independent creators and also big companies like Sesame Street and Getty Images through their proprietary images. As you can see, there is plenty of niches one can get into here. In general, anyone who’s interested in DIY crafts, home decoration, T-shirt printing and wedding gifts can benefit from using Zazzle. Now, let’s see what are the ways you can monetize, starting from your very own talent. 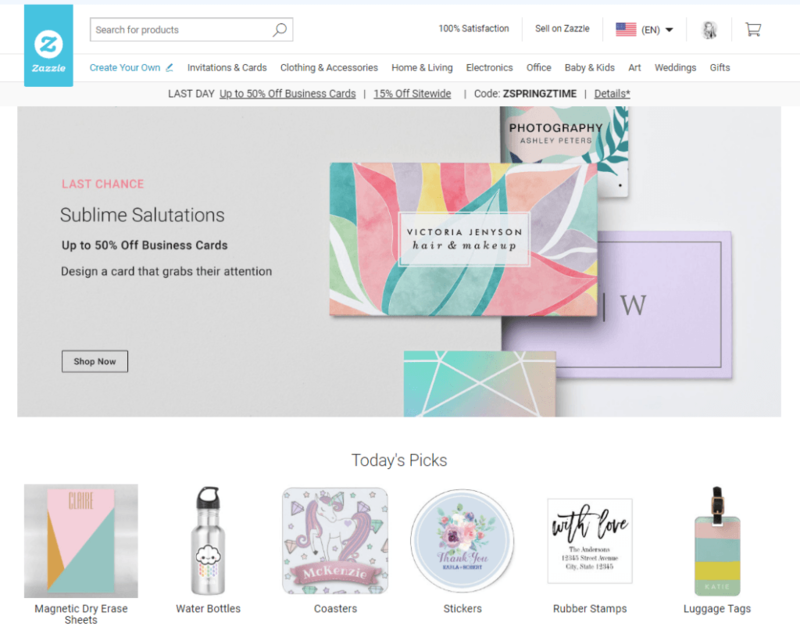 One of the main reasons people come to Zazzle is for the unique designs and if you have the experience in creating beautiful artwork, the first thing is to set up an online store inside the platform and then upload the products (the designs plus the matching merchandise). This is a great way to showcase your skills and portfolio to potential customers, but it can be better achieved with some kind of online promotion. 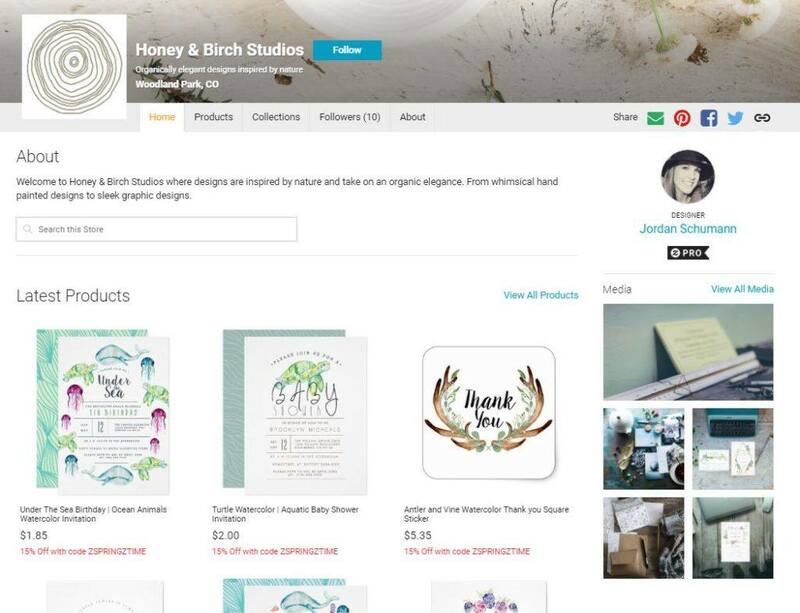 At this point, it would be wise to create a website for your business – one that is separated from your Zazzle store to make full use of the promotional tools that are available to you as a designer. For example, with a store link, one can embed the code on a WordPress site and have it pointed to your store on Zazzle for people to view more products and complete their purchases. Think of the website as an additional platform to attract visitors outside from the marketplace – the more traffic you get, the more stuff you can sell. Your earning as a designer comes from the difference between retail and the base price of an item. That is called royalty and it’s calculated based on the percentage set off the base price. For example, if the cost price of a T-shirt is $16 and the percentage selected is 15%, then then the profit margin upon selling is about $2.50. 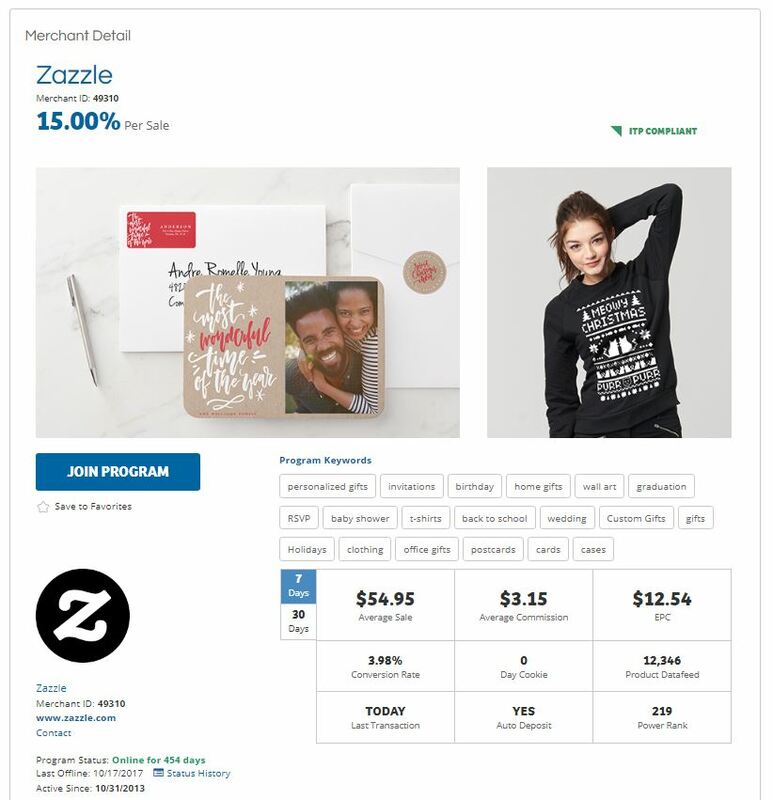 Zazzle recommends that you set your royalties between 10% to 15% and that is considered a comfortable mark-up range for customers while making sure that you still get paid for your work. Of course you can always experiment with different rates, depending on the value of your work, to see what attracts the buyers and what doesn’t. To cash out on your earnings, you can either get paid through PayPal or via check. Each will have its own threshold set at $50 and $100 respectively. One of the good things about using Zazzle to sell your designs is that you can leverage from preexisting traffic that is already coming to the marketplace. That’s about 7.5 million potential customers per month. As long as your store is optimized, anytime it gets featured on the platform, you are sure to get a lot of traffic. Creating a store is free and easy as there are preset columns telling you what kind of business information is required. The promotional tools are also easy to apply to any website containing HTML editor (i.e. WordPress) and it allows additional traffic generation and sales from the search engines rather than relying 100% on the marketplace. Another advantage of using print-on-demand services is that you don’t have to worry about sourcing for merchandise or handle shipping orders. Those tasks are fulfilled entirely by the Zazzle team – you just need to focus on creating beautiful designs, do a bit of online marketing and earn from royalties that you get to set for your work. Your free store is actually created on a subdomain and that means, it will have a difficult time showing up on the search engines. That’s why having a separate website, as mentioned earlier – with a custom domain – is crucial for getting more traffic exposure. Seeing that the marketplace has been around for 14 years, it’s not surprising that it attracts a ton of sellers to open their own stores. That’s good for the platform, but may not necessarily be the case for individual sellers who are new and trying to stand out among the crowd. Whether you like it or not, do expect a lot of stiff competition in the beginning. While most customers have written good reviews, the outcome of the product and printing quality is beyond your control, so there’s bound to be mishaps. To minimize these occasions, it might be best to order and check the items yourself first, before allowing customers to purchase them. Joining the trend of artisan platforms, Zazzle has recently launched a new avenue for craftsman to sell high quality customizable products to the online market. You would apply online and wait for the team to approve of your listing. Made-to-order products are usually priced anywhere between $20+ to $100+ depending on how much you value the production of the craft. Makers will get paid every 15 days via check, after deducting Zazzle’s commissions. Just like the designers, there are no fees whatsoever to use the Zazzle’s Maker Platform. Moreover, you get the privilege to access lower shipping costs, free tracking and automatic notification for customers when they order from you. Your store and products will also get featured in unique placements and promotional emails if your marketing content is appealing. As interesting as it may be, the platform for makers is currently under beta-testing so it’s best not to depend on the marketplace entirely for business because we don’t really know how long it would last. That’s another reason why I feel artisans should also have their own websites to have better control over marketing their products online via the search engines and social media. Even though it’s free to use, you must be willing to give up a small percentage of the sales as commissions to Zazzle. These rates would vary according to product categories and the features you intend to utilize. For now, the platform is only available for makers residing in the US. That is a huge disadvantage for those living outside of this region as it also limits international opportunities. Due to that, the Etsy marketplace may seem like a better platform, albeit more competitive. Now here’s the fun part. Even as a non-designer and non-craftsman, you can still earn some money promoting products on Zazzle. This is made possible through their associate program that is managed by the ShareASale network. Using the unique ID that comes with your user account, one can share a specific store, product and banner links on a blog to attract visitors. This form of monetization is suitable for niche bloggers, college students and budding online entrepreneurs who have the knack for customized artwork. The first thing to do is to find a niche that you like; browsing the product categories will give some ideas on this. For example, individuals who are interested in home decoration can explore the items in Home and Living, while those who blog about wedding can look into promoting Wedding Gifts and so on. Content will be your major force in driving traffic here, so the more articles you write about these products, the more affiliate commissions you are likely to make. Every time you refer a sale to Zazzle, you’ll make 15% (up to 17%) in commissions. The minimum payout is $50 and earnings can be cashed out via check or PayPal. Generating specific links is very convenient and that allows you promote any stores or products to your audience efficiently. Just like the designers, you can also utilize the banners for more attraction. The commission rate, when compared to other similar platforms, is higher and hence, more attractive. Etsy’s is 4%, Amazon Handmade’s is 5% and Redbubble offers up to 10%. As an affiliate marketer, you don’t have to spend time creating products or designs, so you can actually partner with different merchants, focus more on the marketing aspects and diversify your income at a faster rate. Understanding how to rank in the search engines is key to the success in affiliate marketing. For some, this means learning new skills and putting them into consistent actions to get results. This can be time consuming, especially when you are inexperienced, but it’s certainly not impossible. So, What’s Your Zazzle Inspiration? The way I see it, Zazzle is a flexible marketplace that can be used as a primary source of revenue or as a supplemental income. There’s something for anyone who is inspired to do beautiful and creative stuff. It’s a great launching platform for the talented and for the not so-skillful, there’s always the opportunity to cash in on other people’s creation. Would you like to start making money or better yet, create an online business using Zazzle? This robust training program can help you, so do check it out. If you have any thought or question regarding this platform, feel free to leave them in the space below. I have heard of Zazzle, but never looked into it in detail until now. I am glad to run into your post. I am an artist and have tried Fine Art America (FAA) but man, the mark-ups on their products seem pretty high to me so it was a bit tough to make a profit. FAA also didn’t seem to have as big of a traffic as Zazzle. 7.5 million visitors a month?? Wow, that’s quite a lot! I also didn’t know that Zazzle had an affiliate program! I’ve seen a lot of cool products coming out of Zazzle and I didn’t even think about being their affiliate until I read this review. I need to look into this further. Have you tried ordering something from Zazzle? I’m curious to see what their printing quality is like on their paper products like greeting cards and such. Hi Mark, I’ve ordered wall arts and they are pretty impressive. Of course, I make sure to use a high resolution image because of past mistakes (with another print-on-demand company). I would suggest that you do the same thing too before uploading your designs or recommending any products from the platform. Zazzle is really an interesting platform. I could see a couple of advantages here. First, it’s a huge marketplace that anyone can have instant access as buyers and sellers. Second, even if you’re not creating anything, you can still earn affiliate commissions when you promote any of the products. For me, that’s a plus point and worth trying for anyone who aspire to start an artsy online business on the side. I’m so happy that I came across this article, because my daughter is a creative, and I think she would definitely like to try this site out. This article will help her to navigate on how to convert her skills into profit. We’ve been looking at various ways to channel her talents, and this might be just what we’re looking for! So thanks for the review. Zazzle looks like a good opportunity for artists to make a living from their work. I also think that the artist would probably earn more money through allowing customize orders versus selling fixed products. That’s the advantage of print-on-demand feature – it’s less risky and makes more sense in producing a product when you already have a customer wanting to buy it than producing a batch that may or may not sell. This sounds like an amazing opportunity and a wonderful way to grow your creative business. I have a friend that is an artist. She already has her own website so she sells her paintings online, she has also done galleries and markets. I know she has had her designs printed on journals before which were a great success. I am going to refer her to Zazzle – this is right up her alley!